Oh I think it's time for another Jake/Jack picture. Oh! 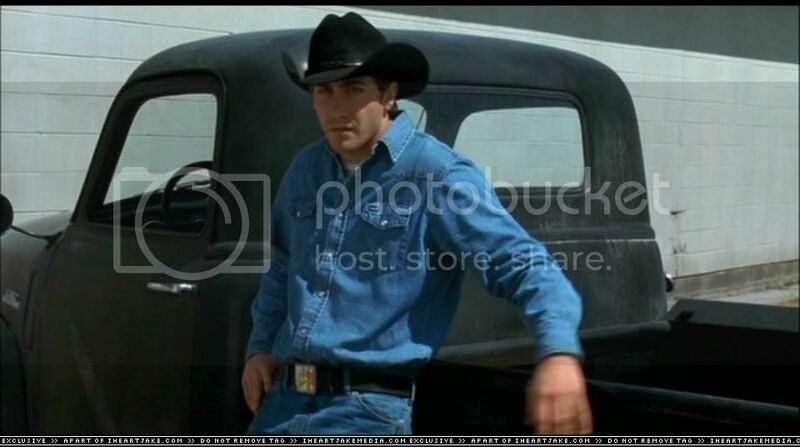 In this scene, doesn't this shirt look darker than the denim one he wears all the other times up on Brokeback? That man can wear a Ronald MacDonald costum that was made for John Candy and he would still look H. O. T. ! He could dress like Courtney Love and I would still drool. He could buy off the rack at Target and I would still cook him breakfast! Am I making myself clear?! Probably. I think Jake enjoys been an actor, but I'm not sure he likes his celebrity status that much. Maybe that's why he doesn't dress like a celebrity when he's hanging out because he doesn't feel like one. He's very low key. He tolerates it because to be a sucessful actor in Hollywood, you need to be very much in the spotlight. Jake seems to enjoy having friends from outside Hollywood and tries very hard to live like a normal person, as opposed to the likes of Paris Hilton, or even Jude Law who always go around with this "I'm-a-celebrity-look-at-me-but-don't-ever-bother-me" attitude. But that's just my opinion. I could be very wrong, of course. I don't know any of them, personally, I mean. I'm with you 100% on all of this. Jude Law does give off that vibe. Totally. I think having style is just understanding what clothes look good on your body, whether you're just hanging out and dressing comfortably or posing on the red carpet. And Jake has it in spades. Didn't Jack have two shirts? One was denim and the other one was darker, like charcoal gray, or navy blue or something. At the scene where he's cutting wood and Aguirre shows up he's wearing a darker shirt. He puts it back on after the fight with Ennis when they both end up with blood on their sleeves. Yep. I think they're two different shirts. They have to be, because we know the other blue one has Ennis' blood on it and is tucked away with Ennis' as they ride down the mountain. Oops, I should have mentioned that the above "dark shirt" pic is from the scene where Jack is talking to Jow Aguirrie when chopping wood. So this is before the fight and the blood. Here's a scene where he's wearing the denim shirt. It looks different. Woohoo! This is the pic I was looking for to add to my collection of "truck pose" pix.. I agree that Jake's got style, although I don't think he goes out of his way to be stylish. He looks good in everything he wears really. As for Heath, I agree that he looks hot when he is put together (like for the Oscars), but I don't find his clothes embarassing - I actually liked his dishevelled look, and I find his fidgeting and nervousness adorable. I never could understand why some people got so worked up about the "teapot" stance ..lol. In case you didn't know, at the I heart Jake webpage (www.iheartjake.com) you can find the entire movie in pictures, particularly every scene featuring Jake. Need to sign in, though. Go to "gallery" then on "Screen captures" you'll find pictures from every movie Jake's been in. You can download them for free. I signed up at IHJ.com, haven't visited there of late though.